The intercontinental ballistic missile Hwasong-14 is seen during its test launch in this undated photo released by North Korea's Korean Central News Agency (KCNA) in Pyongyang, July, 4 2017. The United States is calling for a tough response to North Korea’s launch this week of an intercontinental ballistic missile (ICBM) and one key country Washington and others are looking to for help is China, particularly as the U.S. seeks to draw up new and tighter sanctions. North Korea is expected to be a key topic when Chinese leader Xi Jinping and U.S. President Donald Trump host talks on the sidelines of this week's Group of 20 summit in Hamburg, Germany. Japan, South Korea and the United States are also scheduled to hold trilateral talks on North Korea during the summit on Friday and Saturday. Britain’s foreign minister, Boris Johnson, has called on China to do more to increase pressure on Pyongyang. "The single most important thing is that the country with the most direct economic relationship with North Korea, that is China, has got to continue to put on the pressure. And in the last six months or so, we are seeing some real changes in Beijing's attitude to North Korea and that's got to go further," Johnson said in an interview with BBC radio. China is North Korea's biggest ally and trading partner. Over the first quarter of this year, China saw its trade with North Korea grow by nearly 40 percent. 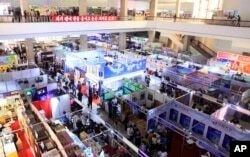 people attend the 20th Pyongyang Spring International Trade Fair in which countries as Balarus, China, Cuba, Indonesia, Iran, Italy and Vietnam participate in Pyongyang, North Korea, May 22, 2017. At the same time, however, Beijing has begun implementing new sanctions, on North Korean coal, that were passed late last year. In February, Beijing banned the import of coal for the rest of the year, and according to statistics released in April, those imports to China dropped by almost 52 percent, compared with the same period last year. Chinese analysts argue that China is already doing more than it is being given credit for. “The West believes that China has great influence over North Korea, highlighting its military alliance with the North and North Korea’s economic reliance on China and argues that strong sanctions through either can change its behavior, but such thinking and assumptions are incorrect,” said Cai Jian, a North Korea specialist and professor at Shanghai’s Fudan University. In an interview with VOA’s Mandarin service, Cai said that what North Korea really needs is security assurance, which China cannot provide. So far, China has expressed its condemnation of the launch along with other countries, calling it a “flagrant violation” of United Nations resolutions. China has not, however, said anything definitive regarding sanctions. 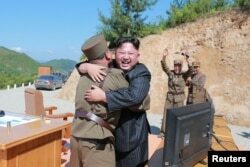 U.S. officials have indicated that restrictions on the flow of oil and other energy supplies to Pyongyang's military and weapons programs, tightened controls over air and maritime traffic to North Korea, and further moves to hold senior officials of the Kim Jong Un regime responsible are among the new sanctions under consideration. Chinese analysts have indicated that controls on travel to North Korea and its export of labor could also be considered. The export of forced labor is a key conduit through which North Korea obtains funds from overseas. The issue was highlighted recently when Secretary of State Rex Tillerson unveiled a new report on human trafficking. In the ranking, released late last month, China was listed among the world’s worst human trafficking offenders. In comments, Tillerson accused Russia and China of, in effect, paying North Korea for slave labor. Still, some are skeptical that sanctions can stop North Korea. Richard Bitzinger, a senior fellow at Singapore’s S. Rajaratnam School of International Studies, said sanctions may make the West feel good but are unlikely to change North Korea’s behavior because they do not impact the elite. Others argue that there are “chokeholds” that could be better used to dismantle and disrupt North Korea’s illicit overseas financing and procurements for its weapons programs. They also note that North Korea’s sanctions pale in comparison to what was used to help broker a deal with Iran. In a recent report, titled “Risky Business”, the Center for Advanced Defense Studies argues that while North Korea uses a wide range of networks to skirt international programs and continue its pursuit of nuclear weapons, the system is “centralized, limited and vulnerable.” The report argues that the disruption of key facilitators could greatly increase pressure on Kim Jong Un to return to the negotiating table. Such work is already underway. Last year, the U.S. Treasury Department sanctioned Dandong Hongxiang Industrial Development Co., its company head Ma Xiaohong and three other employees over their close ties to North Korea’s nuclear weapons program. And while China is opposed to unilateral sanctions, it also carried out its own investigation. Ma was arrested, but charges against her, if any, have not been made public and no one knows where she is. Ma is a former communist party member who also held a seat on Liaoning Province’s People’s Congress before her arrest. Late last month, the U.S. Treasury Department imposed sanctions on two Chinese citizens and a shipping company for helping North Korea. The Bank of Dandong, based in a city that is a key crossing point to North Korea, was also sanctioned, accused of money laundering for Pyongyang.